A year ago, Stefan Frei made an iconic save that helped clinch an MLS Cup victory for the Sounders. This year, he hopes the team won't need such miracles, saying circumstances surrounding the club and its explosive, balanced attack are now quite different. Sounders goalkeeper Stefan Frei doesn’t plan to watch the dozens of replays of “The Save’’ that will inevitably make their way on to Canadian television this week. 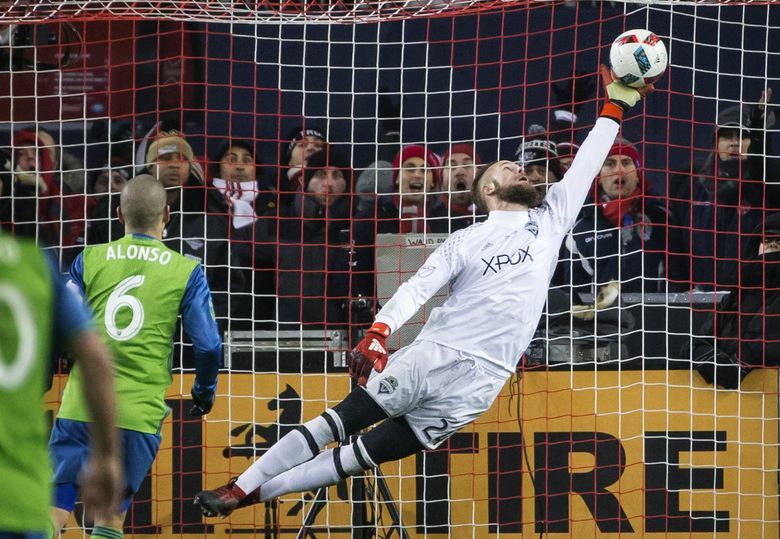 Frei’s iconic save off a Jozy Altidore header late in last year’s MLS Cup championship game helped secure a title for the Sounders over hometown Toronto FC. It also broke the hearts of a Toronto fanbase Frei had spent his first several seasons playing in front of before a 2014 trade. The Sounders head back to Toronto on Wednesday afternoon and Frei plans to make himself scarce as the week progresses. He also hopes the game’s decisive moment doesn’t come down to him having to make another miraculous stop. Chances are, the Sounders won’t go an entire match without a shot on goal this time. The team is far more healthy and high-powered on attack than the defensive-minded gang that gutted its way to a title a year ago on penalty kicks. The biggest factor is the Sounders won’t catch anybody asleep this year. They haven’t come out of nowhere to make the final, but rather, just blew out the Houston Dynamo in the conference championship round. Toronto FC has waited an entire year to avenge the title loss on its home field and now has that exact chance. Frei feels the Sounders found “a strong identity as a possession-based team’’ that manifested itself after an initial struggle in the season’s opening months. A club record 13-gam unbeaten streak mid-summer, followed by a shutout run now at six games and counting has seen the team play some of its best soccer since the franchise began in 2009. Part of that has been the way the Sounders have played the ball forward from the back. During their struggles, the Sounders possessed the ball but had trouble pushing it ahead. But the mid-summer acquisitions of right back Kelvin Leerdam and midfielder Victor Rodriguez seemed to increase the team’s ability to move the ball up and down the field as well as side-to-side. Then, the installation of Nouhou at left back allowed Joevin Jones to bump up as an attacking midfielder and give the Sounders equal speed and passing ability on both flanks. With center back Roman Torres due back in the lineup after a one-game red card suspension, Sounders coach Brian Schmetzer has a big lineup decision to make. There’s obviously going to an odd-man-out from the starting eleven that throttled the Dynamo last week. The most apparent choice would be sitting rookie Nouhou, who, at age 20, would be playing his first MLS Cup game against an explosive Toronto attack and isn’t as polished defensively as Jones. But again, using Nouhou at left back has enabled Jones to open up the attack down the left flank as a midfielder and given the Sounders a look they’d waited all season to attain. Schmetzer could also keep Nouhou in the starting lineup and bump defensive midfielder Gustav Svensson to the bench. But Svensson, who filled in at center back for Torres last week, has been among the most valuable Sounders this playoff run. Still, that’s a better choice than a year ago, when Schmetzer was reduced to throwing any healthy bodies he could find out there. As Frei alluded to, the two MLS Cup teams may be the same, but the situations surrounding this year’s game are vastly different.